The only time that I've been to California is on my honeymoon, 10 years ago this fall. One of the things that I remember is that, as we were driving down the coast from Napa Valley to San Diego, we saw fields and fields of green plants with a green ball on top. We had no idea what they were at first. Upon closer inspection, we realized they were artichokes (to be fair, we are from upstate New York which is not known for its abundant artichoke production). After tasting the Sciabica's Mission Variety Spring Harvest Extra Virgin Olive Oil, I decided on a roasted artichoke ravioli. I took the shortcut of using store-bought ricotta, but I'm sure this would be even better with homemade. I hope you enjoy it. Place 1 Tablespoon lemon juice in a medium bowl of water. Cut off top 1/4 of each artichoke and trim the stem. Peel off outer leaves of artichokes until you get to the inner yellow leaves. Using a paring knife, trim the outside of the stem. Cut artichoke in half pole to pole and place in bowl of lemon water. When all artichokes are prepared, drain off lemon water. Add olive oil, salt and pepper to the bowl and toss to coat. Place artichokes on a jelly roll pan, and roast for about 20 minutes or until tender. Set aside and let cool. Place eggs, flour, olive oil, water and salt in the bowl of a stand mixer. Combine ingredients using flat beater until all flour is moistened. Add additional flour or water to make the dough pliable but not sticky. Place dough on counter and knead for 5 minutes. Wrap dough in plastic wrap and let rest while making filling. Cut pasta dough in half, and cut the half in 4 pieces. Use one piece at a time, keeping the other pieces wrapped. Flatten one piece of dough with your hands, and pass it through the pasta attachment of a stand mixer on the widest setting. Fold the dough into thirds and pass through again, open edge first. Do this 1 or 2 more times. Turn the pasta roller to the next smaller setting, and pass dough through, without folding, 2 more times. Turn roller setting up one more step and pass through 2 more times, again, without folding. Repeat this process until you get it as thin as you'd like. I used setting 6 on my KitchenAid attachment. Place pasta sheet on a lightly floured linen dish towel and cover until ready to use. Continue with other 3 pieces of pasta dough. Place spoonfuls of filling (about 2 teaspoons) about 2 inches apart down one sheet of dough. Brush egg wash on edges around each mound of filling. Take another sheet of pasta and, starting at one end, lay the second sheet on top of the sheet with the filling, being sure to seal the dough tightly around the filling. Avoid creating air bubbles under the dough. 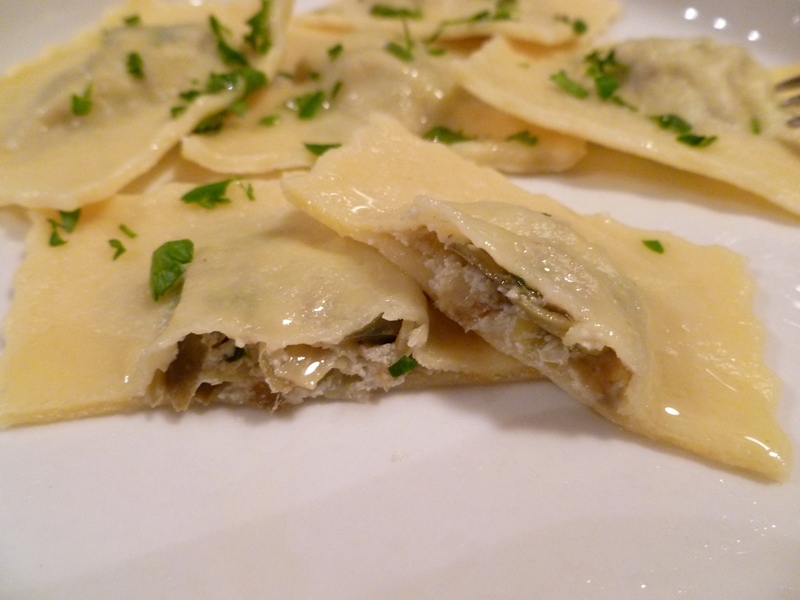 Use a pastry cutter to cut off extra dough around each ravioli. Cook in boiling, salted water for about 7 minutes. Top with additional Sciabica's Mission Variety Spring Harvest Extra Virgin Olive Oil and minced parsley.